Though Ian Stevenson indicated that he researched this reincarnation case in 1971 and 1973, he provided few details of his findings. Stevenson included this case in his book, Reincarnation and Biology, as an example of how facial features can remain the same from one lifetime to another. Click on the images to enlarge them. Manoj Kumar was born on August 30, 1964 in the village of Bhaderi in Uttar Pradesh, India. When he was 5 years old, he began speaking of a prior lifetime in which his name was Nawabsingh. Ian Stevenson was able to find information on the person Manoj claimed to have been. Nawabsingh had served in the army of India and after he was discharged, he turned to a life of crime. He was killed in February 1964, in a shootout with police. Stevenson, in his report of this case, noted that Manoj had made numerous correct details regarding the life of Nawabsingh, though Stevenson did not elaborate. In addition, Stevenson noted that he was convinced that the families of Nawabsingh and Manoj Kumar were not related to one another, nor did the families know each other. 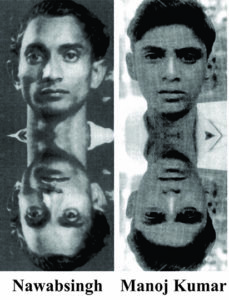 Physical Resemblance: Ian Stevenson was able to obtain photographs of Nawabsingh and Manoj, which do show similar facial features. One must keep in mind that the photo of Nawabsingh was taken in adulthood, while the photograph of Manoj was taken in his teenage years. As we age, skin loses its elasticity, so that as we become older, one’s face becomes more puffy or swollen. I believe this factor accounts for differences in facial appearance in this case, as do differences in the poses in theses images. Split Incarnation or Parallel Lives: Manoj was born about 7 months after Nawabsingh was killed by police. If the soul is involved in the process of conception, which I believe it is, then the soul Nawabsingh | Manoj was animating two physical bodies at the same time for about 2 months, assuming that Manoj was delivered after a normal 9-month pregnancy. Ian Stevenson termed these “Cases with Anomalous Dates,” as lifetimes overlapped in time.